Print from an album of 41 albumen prints by Edmund David Lyon. Kalaiyarkoil is a Shiva temple five miles from Sivaganga in Tamil Nadu, known for its entrance towers or gopurams. 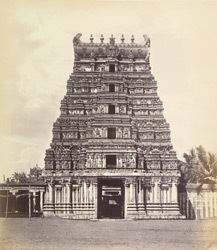 Lyon's 'Notes to Accompany a Series of Photographs Prepared to Illustrate the Ancient Architecture of Southern India' (Marion & Co., London, 1870), edited by James Fergusson, gives the following description of this photograph, '[it is] a view of the smaller Pyramidal Tower, which is said to have been built, about eighty years ago, by Muroo Sheroy, the Prime Minister of the Zemindar, or large landowner of all the neighbouring districts of Shevagunga. If it is of this age, which there seems no good reason for doubting, it is a singularly good and elegant example of its class. The great gateway must, from its style, be nearly of the same age, but looks poor from not being finished. The terra-cotta ornaments have not been applied to the three lower storeys of the tower, though this was evidently intended'.